In the star photograph animation above, Orion's belt shows the way in alignment to find the place of a special star that many ancient civilisations, especially the Egyptians and the Sumerians worshiped as the place of their great and powerful star visitors. The ancients no doubt insisted that since these 'angelic' beings also had great technology and could do a lot more than just fly... they became their 'gods'. (Hence the listing of the important star here as the star of the 'gods' of ancient civilisations that I cover in my book The Hidden Records). This way of thinking occured with virtually all ancient civilisations. 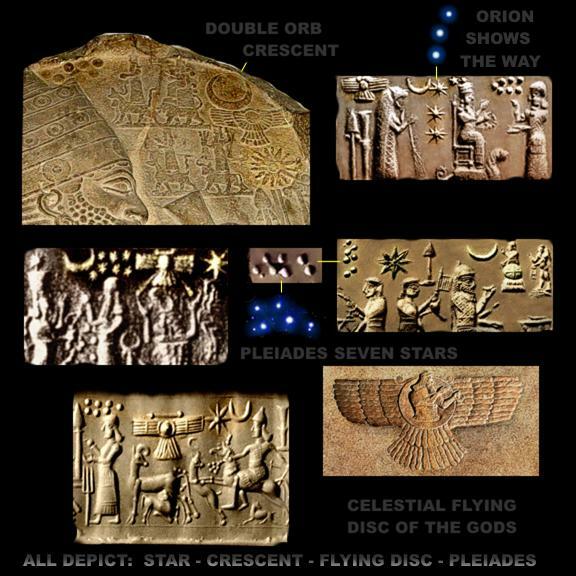 It appears the prime star here was the star system (with worlds depicted with a crescent) of the heavenly visitors of flesh and blood (most often revered as Angels since the time of The Christ) who not only looked like us... They were us! We appear to be linked to the very same evolutional beginnings as they are... somewhere else... and not Earthly at all. In fact the only real difference between 'them' and 'us' is technology. We had simply lost ours after surviving what appears to be a terrible Northern Hemisphere cataclysm. A great time had passed before they visited again. The star visitors worked with two great messengers of the two most followed holy books today. Both great messengers were without doubt fully aware of the sacred ties that we once had with those that came from above. Three of the most powerful nations living right next to eachother would then follow their teachings for many generations - three separate teachings evolved, each sourced from their great cosmic messengers who appear to have left behind encoded knowledge of the place of our physical origins, The Creation and the secrets of the soul. Three prominent nations still arguing today over different ways - each driven by their collection of records that became three of the most followed religions of this world. Some of their teachings were either encoded in their great icons because the people at the time were just not ready for that knowledge, or it was encoded by their scholars because it was only deemed important for its manipulating profiteering elite monarchy. Each appears to hold one third of a profound star genesis secret, that up until now, has been completely forgotten. How sad it is that they both carry so much anger and pain over differences that they would prefer a holy war rather than compromise equality and combine a study towards the truth for one common Creation God story. What is a holy war some may ask? It is war that will be fought over differences in ways, ways altered through time from having the same original truth story in the hands of powerful greedy mortal kings. Over time each became obsessed in their versions and each King would procliam God is only on their side and would help them kill the other. Any true believer in God as a creator of ALL humanity will know in their heart that something has gone terribly wrong and we need to take a moment and look back at all our earliest ancient records before it is too late. All three nations perhaps pretend to be completely unaware that the enigmatic icons of their religions in both instances individually form three parts that if put together reveal the same hidden secret. It is a star secret and it mirrors the same star secret held by the beginnings of all the ancient pyramid civilisations around the world. These three nations’ earliest leaders and hierarchy probably kept this secret to themselves, because the star ancestor records stood a chance at uniting humanity and form peace. The choice made by both civilisations was no doubt inspired by a very old ugly habit... one that is not interested in peace and oneness. Humanity as a whole has always been far more interested in spreading their own power, their own ways... conquering more lands, more wealth and more slaves to build bigger empires. The elite of all nations continued in their old ways creating bigger and better armies that demanded soldiers who cannot possibly be thinking of peace or goodwill. They would probably make sure their common people were struggling in their lives for human comforts. They needed people that would believe they would be able to achieve human comforts in life if they joined the army and killed those not chosen by God. To take their mind off their troubles and peaceful ways they held barbaric games or graphic public executions spilling blood for entertainment. Both nations seemed to believe that WAR was God’s way because each nation believed they were the chosen ones! Each believed it was 'God willing' and therefore good to overpower foreign people, their lands and their wealth - all this in hope of better lives! In most cases most perished and those front line soldiers of the winning side that survived as history shows still had very little extra in their lives. These terrible old ways appear to be secretly working their way back into society again. The youth of today are already being fed video games and movies promoted as entertainment creating interest in bloodshed and violence. Drugs are easily available now to ease the pain for the general public in our out of balance profiteering society where the rich are getting richer and the poor getting poorer. What used to be reliable news on TV is now full of altered truths and biased propaganda. Our children are being prepared as soldiers enticed into easily accessed video blood and war games. They grow up like this having developed an obsession for violence and fighting. but it will be directed towards the interests of the manipulating Elite... the super rich, those who sponsor government puppets and most have absolutely no idea it is happening at all. 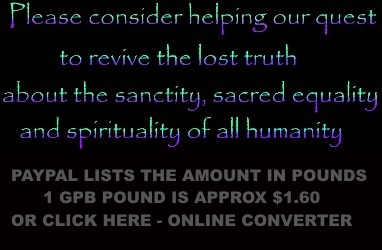 Here is the combined 'icon' secret of the Cross the Crescent and the Menorah that stands a chance of uniting humanity. Go to thehiddenrecords.com and word search the icons there and see what has been hidden from main stream history. There is obviously a lot more to this sensitive story. The graphic below shows the actual star positions of the three sacred star icos of Orion Pleiades and a Sun star and its Exoplanet. This template matches a collection of ancient star maps found in almost every ancient civilisation’s beginnings at the link given. Here they are... The Cross of Orion showing the way to the Crescent Sun star and its world, also the Pleiades seven celestial lights aligning to this same sun star position. The secret given to humanity repeatedly over the ages has now been revived again and easily available on the internet,and I present with references, our physical and spiritual celestial origins answering “who we are and where we come from”. Hundreds of years after The Christ, the sacred cross of the sky (as seen above on the top left) was once again presented to humanity by celestial visitors… angels, tied into The Christ story. And the recipient of this revived crucial information was Roman Emperor Constantine who claimed a similar angelic intervention. The sacred cross would explain the secret teachings of The Christ story and the Bethlehem star. It would appear that Constantine kept most of what he had seen hidden, subsequently introducing an altered version of The Christ story. What he did was hide the truth in symbolism, adjusting it to suit old Greco Roman fundamentals. It became what we know as Christianity of today. The ‘double’ cross in the heavens that Constantine saw is no doubt the sacred cross of the stars of Orion showing the way, as one follows the alignment of the three star in a row cosmic sign post, to the place of our celestial ancestors, the Bethlehem ‘genesis star’. The sickle crescent icon with star holds the same phenomenal star secret: It is most likely the same Sun-like star and its world, in crescent near the Pleiades. This matches the ancient knowledge of the Sumerian and Arcadian ‘star’ visitors found in ancient Iraq and Iran. If the three nations who are the key proponents of these religions were to put down their weapons and look back at their joint beginnings and also the hidden records also of The Tree of Life as seen on this website, they would see greatness and purity and would most likely have less motivation to be at war. Especially if both work towards the higher human rights that are targeted with Oneism here. Both were once given the same enlightening secrets fitting the heavenly teachings of who we really are and where we come from, both physically and spiritually. and the secrets of The Tree of Life. that came down from the heavens! The one chose the Orion sacred cross of the sky to be its icon and spoke of the star of Bethlehem… the other chose the Crescent of a world bathed in the light of its sacred star perhaps inspired by the Sumerian records, and one that chose the seven candles that included using the Pleiades near it to locate its star of David. Pride in this separateness of their heritage rather than spiritual unanimity and equality, would leave them at loggerheads for centuries. It is apparently a fact that Islam chose the star and crescent and added it to Islam some time long after it was written. The unique shape of the crescent strongly suggests that it is far more important than a representation of our barren lifeless moon. How can one reason that the crescent is not the moon? Here is the proof that no doubt will have a considerable impact on those willing to consider this scientific point of reasoning, because if anything it will elevate the importance of our great ancestors! Verifiable astronomically, the moon's crescent never ever has an extended curve crescent with pointing edges like the ancient depictions creating a 'sickle' pattern. 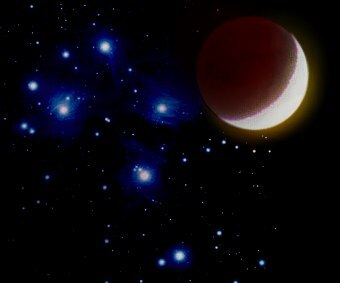 In the image above the moon passes near the Pleiades at its most extended pointed edges of the crescent stage. Note that the crescent shape is absolutely nothing like those of the Sumerian depictions or the Pawnee Indian ancient depictions. produces the sickle shaped pattern. But since one is obviously larger than the other already it is clear that the sickle image cant represent the moon in any possible way. matching the image of the ancient stele below! The Sumerians of the earliest epoch without doubt were very advanced astronomers. Many of their images go to show that they knew of this important material and that the phenomenon they saw was near the Pleiades. 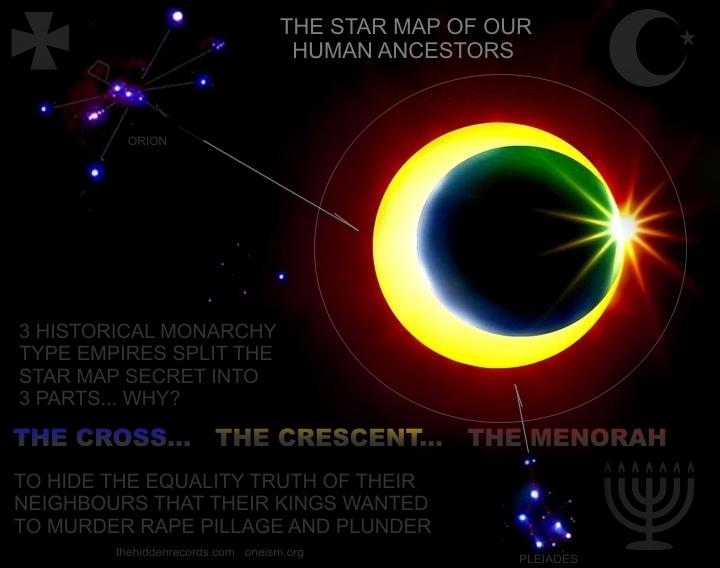 They simplified their rendition perhaps suggesting the world of their ancestors as the crescent and showed its accompanying star, near the Pleiades. Both significant nations, that of the Cross and that of the Crescent, have allowed themselves to venture very far off the path of peace. Both seem more interested in protecting the interests of a select few at the expense of the attainment of greater ease and peace of mind for everyone that would allow all to experience the wonders of life here on Earth and to live life to its fullest potential. Both symbolise the star of our ancestors who came from above. Put the two together and it proves we are all one and equal. But what about the Hebrew iconology of the secret of Solomon, the Star of David and the sacred seven lights of the Menorah? Do they hold the same secret? The time has arrived for all to see the hidden secrets about our past, our ancestors from the stars and our lost spirituality that the decisions of our war-loving forefathers have so selfishly deprived us of.